Ocala, Florida is a sun-drenched paradise tailor-made for equestrians. Boasting picturesque rolling pastures, mineral-rich soil, and a warm climate, perfect for year-round training and showing. The area’s dense concentration of equestrians, breeders, and trainers is supported by a network of equine services, world-class veterinary hospitals, feed and tack retailers, farriers, equine dentists, and major equine transport companies. Our area has a rich legacy of equestrian venues and lifestyle throughout the year. 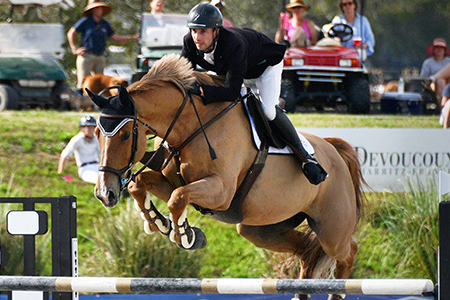 Showcase Properties of Central Florida is a proud sponsor of the Ocala Jockey Club 3-Day International Event, which showcases the best of North Central Florida equestrian luxury living and community spirit in one of Ocala’s most beautiful natural settings. Marion County’s equestrian community is as diverse as it is prestigious, with trainers from every discipline calling horse country their home. From thoroughbred breeders to eventing, hunter-jumper, and dressage competitors, Ocala has something to offer every horse owner looking to take their particular equine venture to the next level. Ocala has been home to a number of prominent equestrians and thoroughbred champions over the years, due in no small part to our area’s ideal climate perfect for year-round training and our historic legacy of equine excellence. As the corse of Florida’s $6.5 billion horse industry, Ocala continues to effortlessly hold the title of Horse Capital of the World. Though Marion County is most famous for its reputation as a leader of equine industries, it’s also the epicenter for active, luxury lifestyles. North Central Florida’s stunning natural beauty, year-round sunny climate, and dense concentration of golf clubs make it a haven for those who love sports and the outdoors, and the options are endless. Locals like to joke that we’re an hour or less away from everything – but it’s true. Beach lovers have their choice of the Gulf or the Atlantic, each only about an hour away in either direction. The Rainbow and Withlacoochee River are well within reach of kayakers, canoers, and boaters, and of course, the Ocala Nation Forest and Florida Cross Greenway offer adventures for hikers, bikers, and trail riders right here at home. Showcase Properties of Central Florida is proud to help home and farm buyers from across the country discover the unique and exceptional Ocala lifestyle. We are a team of professionals dedicated to helping discerning buyers find their place in the Horse Capitol of the World, and passionate about making the local equestrian commuity flourish. North Central Florida is where we live, work, and play – meaning we’re invested in helping customers become neighbors, friends, and valued members of the local community. Become part of Marion County’s rich equestrian legacy and Discover Ocala with us! Browse our comprehensive selections of listings, to from Equestrian properties to Homes with Pools to Commercial Land pieces and everything in between in the navigation above. Not seeing what you’re looking for? Contact us today to speak to a REALTOR® about what you’re looking for.